Highlighting the steady growth and rapid evolution of Indian BPM industry leading to key transformations for its customers, the National Association of Software and Services Companies (NASSCOM) today kick-started the two-day NASSCOM BPM Strategy Summit 2015 in Bangalore. The summit served as a platform for delegates and industry leaders and experts to synergize their efforts to evolve the dynamic BPM landscape, enabling it to deal with ever changing global business trends. 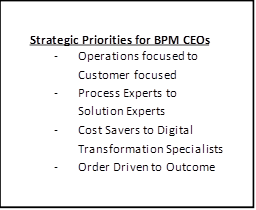 NASSCOM also launched the findings of its CEO Survey on Strategic Priorities for Indian BPM Leaders which focusses on how industry leaders are looking at the future. The survey highlights multiple strategies to stay ahead of the curve and move from being a service provider to strategic partner to their customers. The finding recommends leaders to be more customer-focused and become solution experts driving digital transformations driving specific high-impact outcomes. Further, to ensure that India is ready to meet the projected year-on-year growth of 11-12%% in BPM exports, it is imperative that a talent pipeline is also ready to meet the growing demand required from industry in the future. In order to meet the growing demand for skilled people, IT-ITeS Sector Skills Council NASSCOM (SSC NASSCOM), has created a courseware for ‘Transactional F&A’ in the Finance and Accounting occupation in the BPM industry. The courseware includes a Facilitator Guide and Student Handbook which outlines the pedagogical approach and learning methodologies that aims to empower students with the requisite competencies in this Qualification Pack (QP) / job role. This is a collective effort from the key BPM companies. 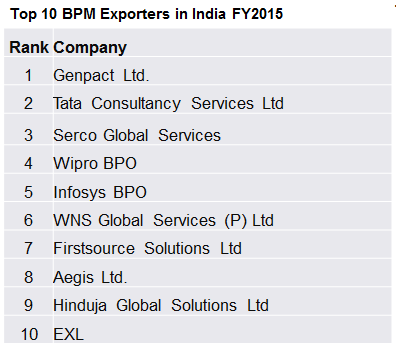 NASSCOM also announced the top 10 BPM exporters in India for the year 2015. The list is topped by Genpact Ltd. followed by Tata Consultancy Services Ltd. and Serco Global Services in the second and third position respectively (Complete list below in annexure). With reported revenues of USD 27 billion in FY 2015, the BPM industry continues to grow and evolve, through the emergence of new markets and verticals leading to exponential growth of the segment. 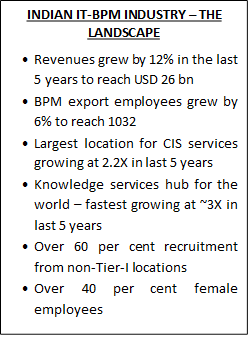 The focus this year was on the ever growing knowledge segment as well as an increase in financial services centers and Customer Interaction Services (CIS). Major BPM firms also focused on transforming business processes through the use of new technology thereby leading to the creation of newer business models and services.